In a world where “hand-made” may be irrelevant, we are proud to maintain a family tradition of quality craftsmanship at our own factory in Tel Aviv, where we incorporate sophisticated 3D technologies to fashion an affordable, original and comfortable collection of pure silver Electroformed jewelry, catering to all tastes and ages. 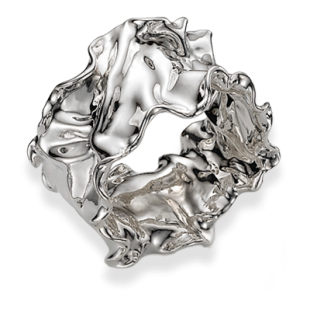 Electroforming lends itself to the creation of strikingly original pure silver designs, so lightweight that size becomes irrelevant and textures are unlimited. 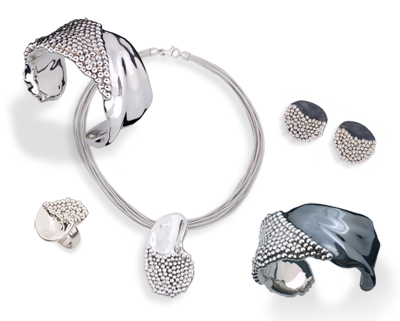 The silver organically shaped forms are enhanced with the additions of semi-precious stones, pearls and hand-recycled glass. Many include natural touches of leather and silk in silver, 24 K vermeil gold, either oxidized or natural. The Bat Ami label developed in the 1960’s, when Bat Ami, an artist and independent family woman, turned an artistic passion into a flourishing business. Her debut collection was a personal interpretation of the traditional ‘filigree’ that she learnt from an old Yemenite jeweller. 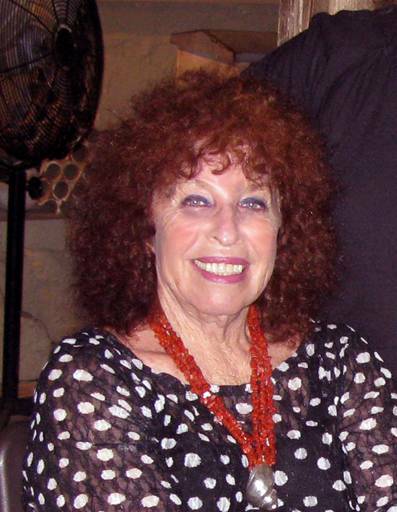 Her unique style and flair soon won international acclaim as part of the evolving fusion of traditional and contemporary in the Israeli fashion scene. In the 1970’s Bat Ami went on to pioneer the Electroforming technique, previously only of academic interest and designed freeform lightweight pure silver jewellery with complex unique shapes, turning this previously science-only application into a renowned sophisticated contemporary art form known worldwide as “Israeli Silver”. The ethos of the Bat Ami label, under the management of Bat Ami’s daughters, Einat Kartin and Lilach Pery is one of imagination, inspiration and social responsibility. Over the past twenty years, both creative designers continue to expand the Bat Ami brand further by developing new electroforming techniques. Their distinctive designs and modern sensibility of fashion along with uncompromising production standards, have turned the Bat Ami brand into the stable establishment it is today. A recent addition to the designing team is Lilach’s son, Lee Pery, who uses his extensive architecture education to move through the 21st century for both inspiration and technology. To assure quality and cost, the Bat-Ami line is all hand-crafted in Israel at the company’s own factory which is a reflection of the diversity of Israeli society. We are a mostly female business that is proud to support the empowerment of women and promote coexistence between all parts of Israeli and Palestinian society. Bat Ami’s production values assure quality, durability as well as individuality in every piece. Our designs are constantly evolving and innovating to complement the changing trends and our continuing success is a testament to the combination of the artistic talented inspiration of each of our designer’s own unique style. Today the Bat Ami collection is available in over 22 countries worldwide and is regularly featured at the top international jewelry shows and in fashion magazines. During the Electroforming process, pure silver is electrically layered over a resin prepared hand-made form to create a unique organic piece without the heavy weight and cost typical with conventional solid silver jewelry. The resin inside every item helps prevent denting of the soft pure silver. Born in Tel Aviv, Bat Ami became part of the first ever generation of women to combine raising a family with a demanding and rewarding international career, Bat Ami’s designs are infused with both Eastern and Western influences; her work represents the spirit of the ‘melting pot’ that is the essence of Israel. Einat’s designs are inspired by a love of nature and travelling. She uses wood and wax carvings to form pieces with natural textures to reflect the beauty of our environment. Promoting the Bat Ami line worldwide enables Einat to travel and explore her passion for languages, love of people and exotic cultures. Lilach uses soft wax forming and weaving, inspired entirely from within a meditative process. As Bat Ami’s main designer and Head of Production, she demonstrates a dedicated model of industry management combining her natural social awareness with our high production standards. Lilach personally assists over 25 employees in their everyday struggles to run families, raise kids and work in the demanding jewelry industry. Lilach’s younger son Lee Pery, joined the company as jewelry photographer during his architecture studies at the University of Tel Aviv where he mastered advanced 3D design and printing software. Lee harnesses these techniques to create fresh, eclectic and one-of-a-kind designs – small-scale 3D art structures of “wearable architecture”.